"It has been quite an emotional project I'd have to say." says Robin Affolter. "Our self developed Q-Play IPTV system had to leave the rooms, after entertaining Radisson's guests for over 8 successful years, which did hurt a bit". The Q-Play IPTV system was ahead of it’s time. Offering a number of services, 250 channels, VOD, wifi, Laptop-On-Line and VOIP. We are proud that Radisson has chosen to continue relying on IRS as it’s provider. Otrum is the market leading provider of guest centric software for the hospitality industry, with an installed base of over 160,000 hotel rooms across Europe, the Middle East, Africa and Asia and is one of the preferred suppliers of the Radisson Hotel Group. 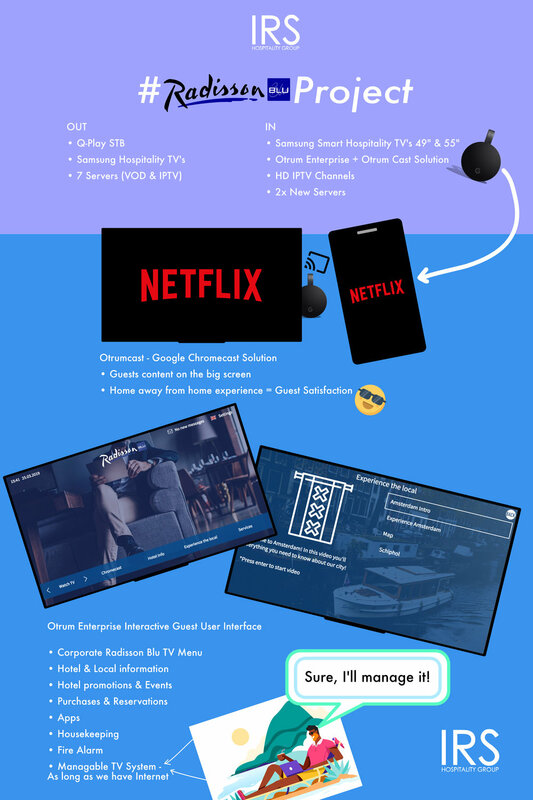 With the Otrum Enterprise and OtrumCast Solution (Google ChromeCast) we will add value to the guest experience, in this case guests can stream their own content to the TV like Netflix, YouTube, Videoland, Fox and more so Radisson doesn't stop their guests from watching their favorite TV shows and series! Beside this cool BYOD feature (which we believe is a must for hotels today), Otrum allows guests to make any purchases, get hotel and local information, watch HD premium IPTV channels and use the smart TV's apps. Click on the button below to get more information on Otrum Enterprise. IRS Hospitality Group is an official Otrum Partner: if you have any questions please contact us, consultations are FREE! FlyZoo by Alibaba | The hotel future, what do you think?